The 2018 season looked to be one of the strongest years the state has ever been on the boys side in the horizontal jumps. The state returned NBIN All-American Kevin Snyder (Christ School), NBON All-American Christopher Alexander (Rocky River) and Eric Haddock (Southeast Raleigh) who jumped 23-8 last year. 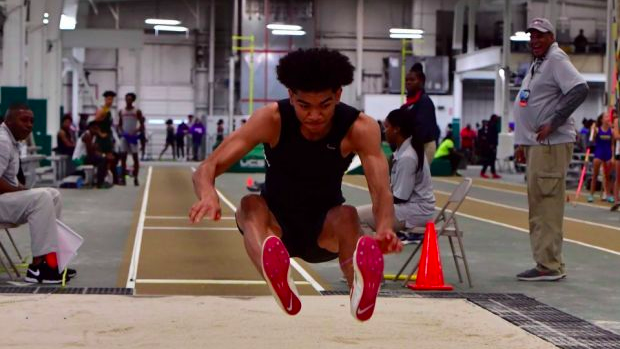 Heading into last weekends NCRunners Holiday Invitational Haddock was the state leader in the Long Jump at an impressive 23-4 and Alexander had cleared 48-6.75 in the triple jump. Both Alexander and Snyder were scheduled to compete last weekend. You've likely been familiar with Joshua Brockman's name in the hurdles. The senior holds an indoor 55m Hurdle mark of 7.37 and an outdoor 110m Hurdle mark of 13.86. In 2017 Brockman was the 15-16 USATF JO National Champion in the 110m Hurdles. Last summer, for the first time in his career Brockman participated in the Long Jump. After three competitions he ended the season with a best of 22-11.75, placing 6th at the USATF National Championships. This year it's apparent that Brockman has officially become a combo hurdler and jumper. He currently leads the state in the 55m Hurdles at 7.52 as well as the Long Jump after jumping 23-6. For reference, 23-6 would have placed Brockman 4th at last years New Balance Indoor Nationals in the Championship Section. His current mark of 23-6 is good for NC#1, just ahead of Haddock at 23-4, as well as US#2. It's still early in the season, but if Brockman continues to focus on both the hurdles and long jump throughout the season he'd be an All-American contender in both events. With this being his fifth time ever competing in the event, I think it's safe to say his ceiling is certainly much higher than what he's already achieved. I'm sure Brockman's future coaches at NC State are thrilled to see his success so far this season in both the Hurdles and the Long Jump. It'll also make the horizontal jumps in North Carolina that much tougher this year adding a fourth national caliber jumper to the state.